I saw went to see the Wizard this weekend. Nine times. I’m not complaining. We were exhausted after all those trips, not to mention the practice runs. In the spirit of full disclosure, I didn’t actually make the journey. The Kids did. I got to play Stage Mom. I’m not That Stage Mom, though. I won’t claim to have any talent, when it comes to acting or singing. I’ll leave that to The Kids. I don’t even coach them. I leave that to the professionals. I’ll hot glue, sew buttons, supervise backstage, and volunteer The Man to build sets. You may recall, they’ve done shows with the Augusta Players children’s wing before (Aladdin, Sleeping Beauty, and Charlotte’s Web), but this. This was a main stage show. Don’t get me wrong. The Junior Players is a wonderful organization with great leadership. Both kids have learned so much and had incredible experiences. I hope they’ll stay involved for many more years. I’d like to think we’re just getting started. There’s a magic to the main stage, though. The teens and adults are the best of the best. We’re told they take the most talented kids. The sets, after hours of hard work, come together like the real thing. The costumes and the makeup are barely short of unbelievable. There’s a pit, filled with a real, live orchestra. Back in February, both kids asked to audition. I hesitantly said yes. If they were even assigned parts, this would be a big commitment. We decided to focus on first things first. They auditioned and, to my surprise, were called back. You see, my worry for them was more than “gee, I hope they get a part.” The Boy wants to act. Besides piano, it’s the only activity he wants to do outside of school. The Girl thinks it’s pretty fun, but she hasn’t narrowed her career focus just yet. They won’t always get their way, and although The Boy is laid back, it would’ve been sad if she’d gotten a part, but her brother didn’t. She’d gladly be a chair or a tree and stand on stage in a pretty costume. He fashions himself a thespian. 23 munchkins in all. The Boy even had one line, as the Munchkin Braggart. The Girl wore a flowery hat and more eye makeup than Lady Gaga. Both were over the moon excited. We were excited for them. So, yes. They were awarded roles. We buckled up and organized our calendars and a carpool. As an aside, I highly encourage those of you with multiple children to get them involved in the same activities. Rehearsal night = date night. I kid. Encourage them to follow their hearts. And their big brothers. The rehearsal schedule isn’t for the faint of heart. Tech week, which is the week leading up to the performances, will try to kill you. If you’re not prepared to volunteer and pull your weight, this might not be for you. But there’s more. You’d be missing the point entirely, if I didn’t tell you the best part. This was the best group of people. Understandably, the adults are nervous when a cast is made up of a large number of young children. Heck, I think the parents are wary, too. These kids had mics. Like, the kind that turn on and project sound. They had hours of downtime between the 10 minute Munchkin sequence and the curtain call at the end of the show. 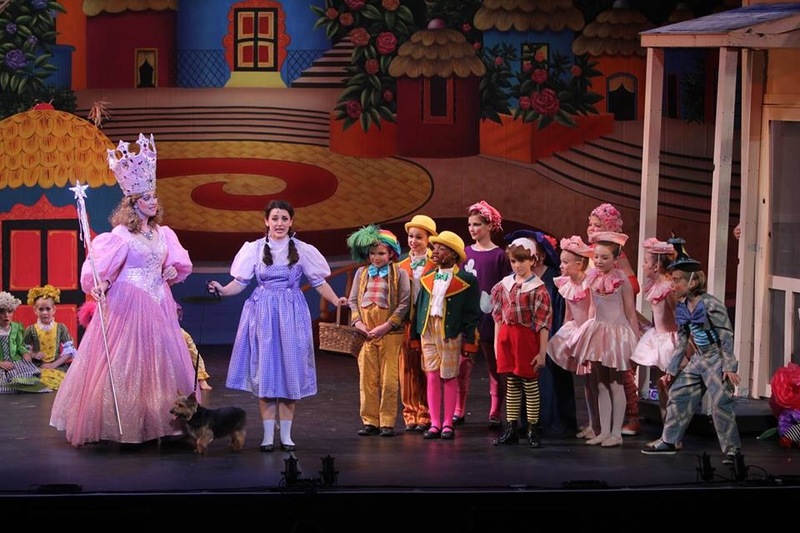 Nine shows in all, including the six daytime school shows during tech week. They were stuck in the (badly in need of renovation) non-air conditioned green room at the Imperial theater, where it got so hot the mic tape melted off their faces. Not to mention the fact that they were wearing very heavy polyester townspeople clothing and lots of makeup. No one complained. They didn’t argue. On stage, they did what they were told and so much more than that. People talked about the remarkableness of this group. The moms even got along, too, despite having spent all week together in that sweaty room. If you know women, you get it. To say this was an excellent experience for these kids would be a total understatement. They made friends and were sad when it was over. As much as the adults were ready to get back to regular daily life, I think we’ve all missed our Oz family. I don’t tell you this as the Stage Mom or Mother Braggart, but more as a service announcement. We’ve got a great thing in The Augusta Players. The Wizard of Oz sold out the Imperial with its talent, pyrotechnics, smoke effects, and strobe lights. The monkeys actually flew, and I’ll be dammed if Mrs. Gulch didn’t ride her bike 25 feet above the stage, right before the house spun across the stage. Next season, which begins this fall, includes The Addams Family, Shrek, West Side Story, and the classic, A Christmas Carol. The Junior Players’ schedule won’t disappoint, either, I promise. There are camps this summer. As The Kids will tell you, they’re well worth the money. For more info, including audition announcements and ticket purchases, visit http://www.augustaplayers.org. It may seem obvious, but I’m more than impressed. I hope that, aside from getting to be on stage, my kids will gain confidence and make lifelong friends. So far so good. They’ve found a home in the theater. There’s no place like home (see what I did there? ).